Whether your goal is to replace old fixtures that are outdated and potentially hazardous or if you want to make upgrades to make better use of the space, M Foley Electric can help. It is important to hire a South Shore electrician who has years of experience providing quality residential electrical services in your area. The two best projects you can do to update a Greater Boston garage is to perform a complete power upgrade and to install more modern and effective lighting. Most homeowners demand more from their garage space now than they did just ten years ago. So when you take into account the age of your South Shore home, it is understandable that a lot of electrical upgrades will need to be done. Replacing an outlet here and there probably won’t be enough to help you achieve your goals. Power tools, gadgets, and even electric cars are all becoming a part of the average homeowner’s garage. Throw in a couple of specialized pieces of equipment, and your old electrical system won’t be able to handle it. What do you want to do with your garage? Do you want to create a “man cave” or a “she shed” for your hobbies and activities? Do you want to create a well-lit space for your kids to access sports equipment, bicycles, and other gear? Do you want to increase the storage capacity to get some of the things moved out of the house? Do you want to relocate your washer/dryer and water heater to the garage as part of a larger remodeling project? Whatever your goals, make sure to write them down so you can discuss them with the electrician when you upgrade electrical wiring. Each goal will have different electrical and lighting needs, so it is important to express what you want to do in the space to your electrician. Start shopping around for the items that you want to have installed in the garage. Wait on buying them until you speak with experienced South Shore electrical services. You don’t want to purchase something that cannot be used in your garage due to city coding regulations. Create a list of the things you want to purchase and make sure to save room for them in your remodeling budget. Speaking of budgets, make sure to sit down and determine how much money you have to upgrade your South Shore garage. Include costs for materials, the appliances, and equipment you want to buy, as well as anything else that you want for the space. This will help you figure out if you can afford to hire a South Shore electrician to take care of the work that you want to be done. Make sure to show them your list of appliances and materials that you want to use. They might be able to get a better rate on them for you as a commercial service provider. The next step is to get a bid from a trusted residential electrical provider in your local area. 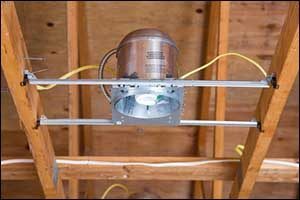 M Foley Electric has a solid reputation in the Greater Boston area and can help you with your plans to upgrade electrical wiring and lighting in your garage. We can help you improve your outlets and switches, provide Ground Fault Circuit Interrupter (GFCI) safety outlets, and provide you with convenient and affordable solutions for your home. Some of the most popular requests for upgrading garage lighting include high-intensity lights, such as LEDs or halogens. These are great for any work you might be doing, including auto repairs, detailing, DIY projects, and more. Recessed fixtures can be added to finished garages for extra task lighting, which is a nice touch over laundry areas, work benches, and storage spaces. The classic garage lighting includes fluorescent light fixtures, which are low in cost and quick to install. However, if you hire South Shore electrical services to upgrade electrical wiring, you might want to upgrade your lighting as well while you’re at it. If you are looking to hire a South Shore electrician to assist with home remodeling or upgrades to residential electrical, give M Foley Electric a call at 1-857-829-0516. Our team can answer any questions that you might have about our South Shore electrical services and can make professional suggestions to upgrade electrical wiring to suit your needs. Call today to learn how you can maximize the use of your garage with updated lighting and power.